On the third Sunday of Easter every diocese in the country offered Masses and prayers. Christian leaders call the faithful to "mitigate the pain of the population" marked by war and the refugees. Not to look for Jesus among the dead, but "among the living" and among those on the margins of society. " Colombo (AsiaNews) - On the third Sunday of Easter, the Diocese of Sri Lanka celebrated the feast of the Small Catholic Communities. Yesterday all parishes of the country offered prayers based on the theme "Let us love the Lord ... rebuild and relive the small Catholic communities," inviting the faithful to rediscover the origins of the Christian community in Acts of the Apostles ( 2:42 - 4:32 and 47 - 37). Nimal I. Perera and Fr. 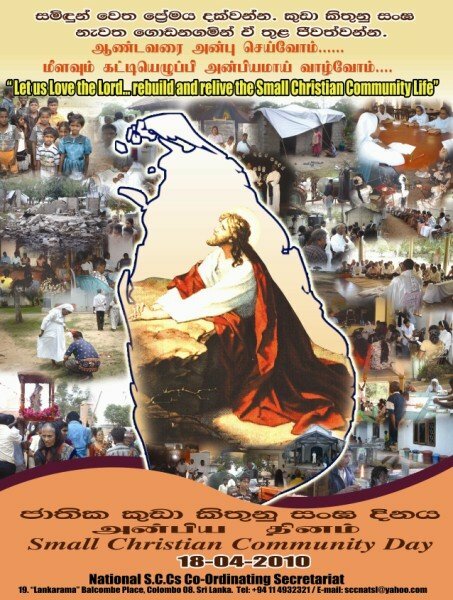 Eric Fernando, National Secretary and National Director of Catholic Community of base (SCC) of Sri Lanka issued a special message on the occasion of celebration. They urged the faithful to "welcome one another as brothers" and realize the fulfillment of the "Kingdom of the living God." An appeal to solidarity, explaining Scc leaders to "mitigate the pain and despair" of the population, with particular attention "to the refugees of war in the north and the poor”. Christian leaders are referring the faithful to the Scriptures (Mark 16: 6 - 7) and reminding members of the Catholic Communities not search for "the body of Jesus in an empty tomb," but "to meet him among the living, especially among those who are "relegated to the margins of society."